Hi there! 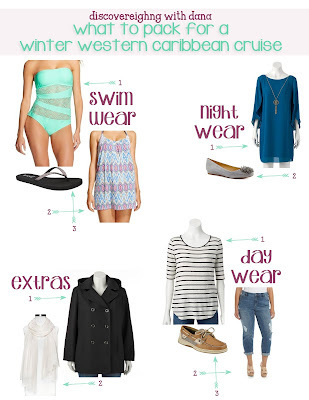 I thought I would share some winter cruise packing tips with you, as it's been the only time I've cruised. Packing can be a bit tricky for this time of year, because you really do need warm weather clothes & cool/cold weather outerwear. Both of my cruises were in mid-December, and docked on the Yucatan Peninsula in Mexico. Once we arrived in Mexico, the weather was great, not too chilly, not too hot. On board, the weather was a little cooler at night, but still warm enough for laying out during the day. Transitioning out of Texas and info the Gulf (and vice versa), it was cold! I have photos of me in my coat while still on the ship as there was a true distinction in weather when we got closer to Texas. So, I put together a little graph to show what you'll need for different parts of your trip. Now, keep in mind these are recommendations are for Mexico in December, so things weather will likely vary if you are headed farther East in the Caribbean. I've included ideas for swim, day, and night wear along with a couple of extra recommendations. I had a cute little cardigan added to my list, but I forgot to include it. If you are going to explore the upper deck in the evenings, it's something you'll definitely want to carry along. If you're thinking about carrying a fun beach hat, leave it at home. It's far too windy on board to keep it in place. :) I hope these few tips and inspiration. I'll be sharing more about cruising tomorrow. And don't forget, it's still National Plan a Cruise Month, so there are tons of sales going on! Contact me via email, and we can get you fixed up!